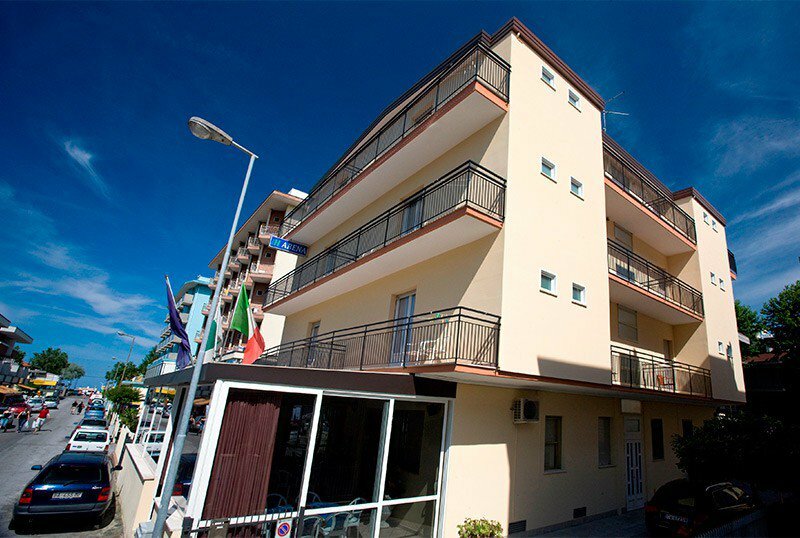 The Hotel Arena , 3 stars in Marebello di Rimini, managed by the owners, has air conditioned rooms, parking and WI-FI. Admitted animals of small and medium size. The hotel is located in Marebello di Rimini, a few meters walk from the beach and the promenade full of clubs and shops for all tastes. Recently renovated, they have a balcony, air conditioning, WI-FI, slatted beds, 22 "LCD digital TV, safe, telephone, private bathroom with shower and courtesy set, hairdryer, minibar. Bicycles subject to availability, open-air porch, hall, satellite TV room, bar, lift, welcome drink. CONVENTIONS : beach, amusement parks, discos. Shuttle service and organized excursions available. PETS : small and medium-sized pets are allowed. LUNCH AND DINNER : every day chosen from three menus based on meat and fish with homemade pasta and desserts and vegetable buffet. Cuisine taken care of by the owners and inspired by the Romagna and national tradition. Water, wine and soft drinks included in the all-inclusive formula. At meals : high chairs, early entry into the dining room, baby food preparation, baby menu. The Hotel Arena has an agreement with the Bagno n. 106. Available at the establishment mini club, entertainment, playgrounds, cabins and Jacuzzi (for a fee). Price list is per person per day for minimum stay 3 days. - Fun Parks Offer: Discounted tickets for fun parks on the Riviera Romagna, without a row at the casks, valid for 2 consecutive days. - Offers and promotions can not be combined. - Deposit: a deposit is required by bank transfer or postal order. - Cancellation: In case of cancellation of the reservation or no show, the hotel will retain the deposit paid as a penalty. - Early departure: In case of early departure, or before the day stated in the confirmation, the hotel will be charged with the penalty amount for the 3-night room rate. Full board, drink with parasol meals with sunbed on the beach, air conditioning in a separate room. - Full board, drink with parasol meals with sunbed on the beach, air conditioning in a separate room.